Mental disorders are the third-leading cause of health loss for New Zealanders, second only to cancer. Yet there are steps that can be taken to lessen or avoid the symptoms, according to Mental Health New Zealand. The organisation is urging people to take ownership of their own mental health and wellbeing as part of World Mental Health Day (October 10), through simple actions that may add up to make a big difference. Naturopath, nutritionist and herbalist Janella Purcell agrees, and says making a commitment to change or adopt new habits is the first step in taking charge of a person’s own wellness and vitality—physically and mentally. People who have the best quality diet have the lowest risk of development of depression and anxiety. We also know that diet affects immunity. One of the most important foods you can introduce to your diet is Omega-3. There is much evidence to suggest lack of consumption may be associated with mood disorders, with research suggesting Omega-3 is related to a number of biological processes associated with brain functioning. 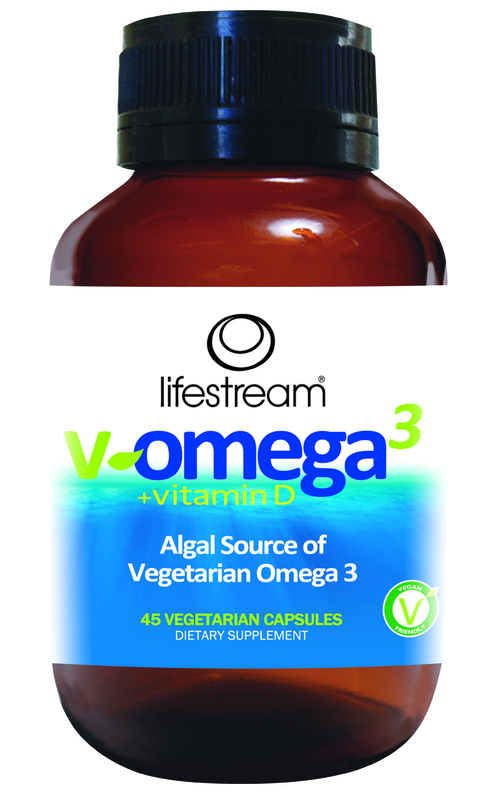 The most sustainable and clean way to get an adequate daily dose is with Lifestream’s V-Omega3 + Vitamin D capsules, derived directly from sustainable microalgae, grown in controlled conditions. It is free from impurities and contaminants such as mercury, which is often found in fish oils. It’s also a pure and sustainable source of EPA (125mg) and DHA (250mg) per capsule. Studies show a strong relationship between depression and inflammation—some suggesting depression is an inflammatory disorder. Depression is a state of immune activation. There is a low-grade increase in the inflammation that occurs not only in depression but in most major psychiatric disorders. Those who are the most physically active seem to have the lowest risks of developing depression and anxiety. Why? Exercise releases feel-good chemicals including endorphins, which may help ease depression. Exercise can also reduce the chemicals that cause inflammation and often worsen depression—plus it helps to raise body temperature, which can calm things down. Many of us underestimate the value of getting enough good quality sleep, regularly. The optimal sleep schedule? Eight hours per night and one hour for daytime naps. Any less than the eight hours a day is likely to be add to toxic load, lead to damaging oxidative stress and inflammation. Cashews contain the amino acid L-tryptophan which is broken down into calming niacin (B3). Tryptophan is also made into serotonin, one of your body’s most important neurotransmitters. Serotonin gives a feeling of wellbeing and happiness. Use food as medicine. Eat your cashews mindfully. A lot of work goes into getting just one cashew into your mouth. Ideally buy them organic, eat them raw, or for increased nutrients and easier digestion – soak them (activate) for about five hours, rinse, then drain. Also consider a wholefood B vitman, such as Lifestream Natural B Complex, which is formulated from fermented quinoa. • Processed and refined salt. Choose Celtic sea salt or Himalayan instead. Do something nice for a friend, or stranger. Thank someone, smile, or volunteer at a community group. • Vegetarian and vegan approved. Lifestream are meticulous about quality. All products are fully tested and guaranteed. Rigorous quality assurance testing and audits are supported by comprehensive documented evidence.